Cooking for the family isn’t easy, especially when everyone has different tastes and needs. There’s often little time to prepare but you still want to make sure you’re providing a meal everyone will love that’s also good for them. The good news is that with a little planning you can prepare nutritious and affordable meals for your family with little fuss. Healthy meals don’t have to be fancy or time consuming to prepare. Have a list of family staple recipes which you can make in under thirty minutes for those busy weeknight dinners. Quick recipes are not only best for preparing in a hurry, they also usually contain fewer ingredients which means less items in your shopping basket. If you don’t already have some favourites, there’s plenty of places you can go to find them. Try taste.com.au for Quick and Easy Recipes, Jamie Oliver’s Family Basics or the Australian Health Food Guide’s Top 20 Quick Family Meals. Plan out your week in advance so you know what you’ll be cooking for dinner each night. Use this as the basis for your shopping list – which also has the added bonus of reducing impulse purchases once you get to the supermarket. When you plan ahead you’ll have all the ingredients on hand for when you need it, with no last-minute dashes to the supermarket on your way home from work or after school care pick-up. You’ll also be less likely to resort to takeaway foods which can save you money too. Record your meal plan using the meal planner on the Taste website, or simply write it down on a whiteboard, blackboard or in your diary. 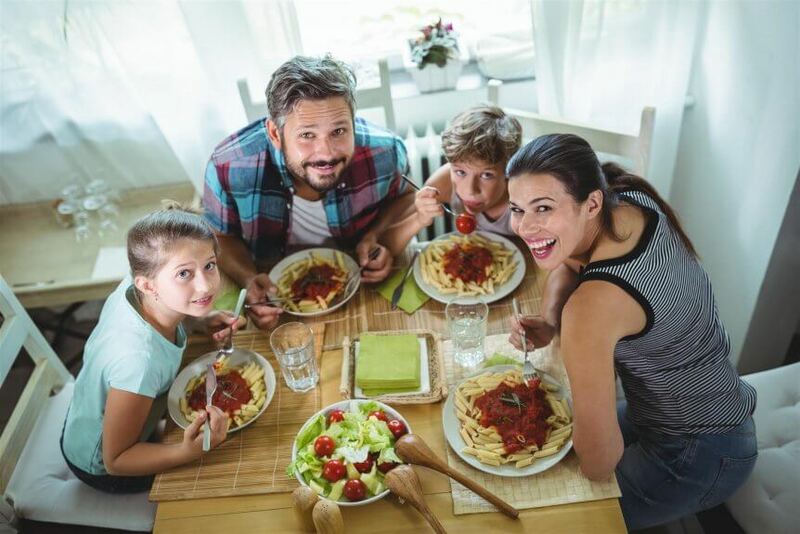 Understanding what your family needs to eat for optimal health can help you plan healthier meals. If you’re still unsure, the Eat for Health website has some resources for meal planning and healthy eating on a budget. Healthy and delicious family meals don’t need to be expensive or complicated. If you plan ahead, use simple recipes and understand healthy eating you can provide your family with affordable meals they’ll love.